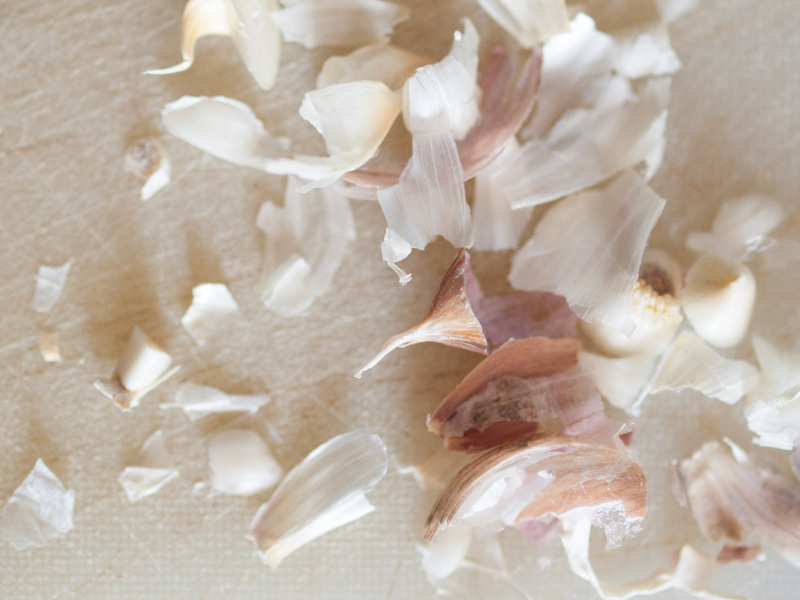 I’ve been wanting to post this recipe for quite some time now. Yet even after I finally (finally!) buckled down and took photos, edited them and even uploaded them onto WordPress, I still didn’t post. I felt the pressure to write something eloquent– after all my last post was half a year ago! The fact of the matter is that working a full-time job (and riding two very popular trains to and from there every day) leaves little room for much else. On weeknights I carve out my time to hang out with Phil, make dinner, maybe watch Colbert’s monologue to help us swallow the latest news, prep for the next day. On the weekends we sleep and play catch-up. Can you relate? Still, eating well (though not necessarily perfectly) is something I prioritize. I’m not really a meal planner, but I’ve been trying to do more “veg prepping”— washing and cutting my market haul– on Sundays. Then during the week all I have to do is cook my already prepped vegetables and toss them with whatever else I feel like making. 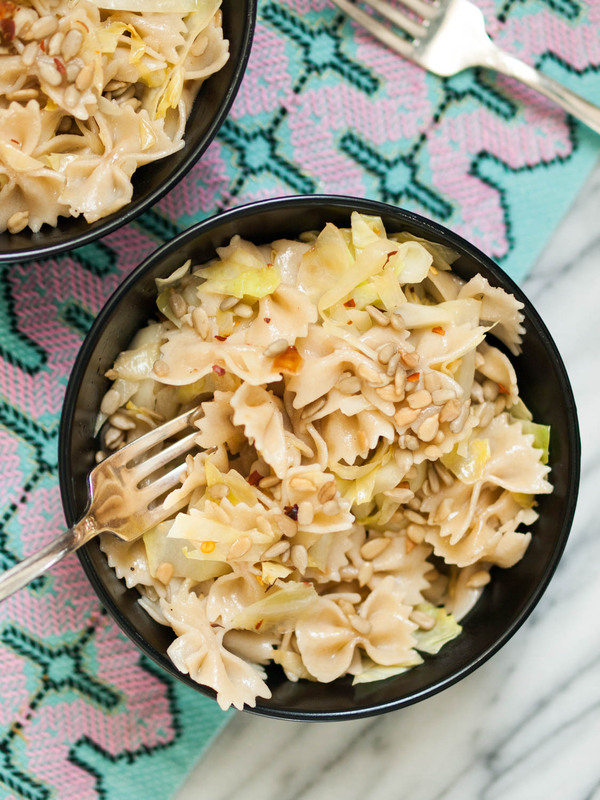 This pasta dish is one of those throw together dinners that has become a staple in our home. I like to joke that it combines my Eastern European Jewish roots with my Italian sensibilities, simultaneously familiar and satisfying. 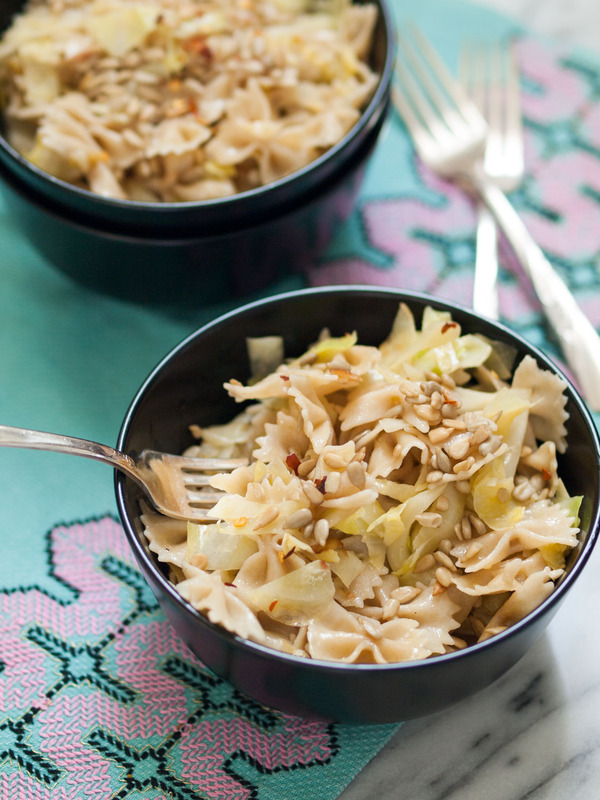 I’m not sure when I started adding sunflower seeds, but they go beautifully with tender braised cabbage, providing a protein boost and salty crunch. Drizzle a bit of oil in a large skillet and cook the garlic and red pepper flakes on medium low for about 3 minutes, watching closely and stirring as needed. Add the cabbage and a couple splashes of water and turn up the heat to medium high. Cook for about 6 to 8 minutes, stirring every now and then, until tender and browned in places. Season with salt and pepper. 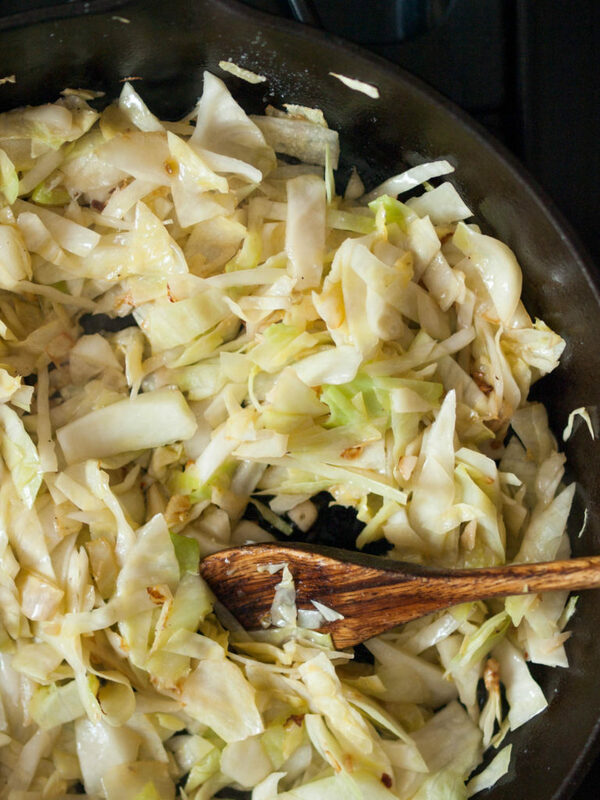 Combine the (cooked and drained) pasta with the cabbage and, if desired, drizzle with a little more olive oil. Sprinkle the sunflower seeds on top and serve. This entry was posted in Mains and tagged gluten-free, healthy, nut-free, seasonal, soy-free, vegan, vegetarian on March 7, 2018 by Sarah.